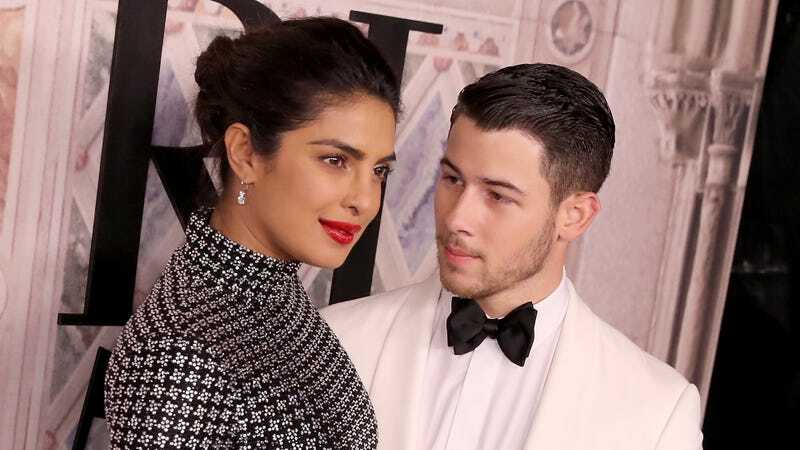 Priyonas... or is it Nickopra... okay whatever their couple’s name is, Priyanka Chopra and Nick Jonas are indeed getting married, despite the fact that my brain still doesn’t fully register them as a couple. And of course the act of getting married includes a wedding registry, which Jonas and Chopra now have, and it is a fascinating peek into their domesticated life as a couple. A record player, because Chopra plays “everything from Ariana Grande to The Chainsmokers on my record player. It looks so cool. And every party with me ends up in a dance party. It just has to happen!” To which I say, no amount of vinyl production can make The Chainsmokers sound good but I digress. A pair of rollerblades, because Chopra rollerbladed as a ’90s teen. “I wonder if Nick can rollerblade!” she wonders. I wonder too. I really wonder. A Vitamix blender, which I admit is not too crazy of a wedding gift on its own, but seems more insane considering what Chopra thinks you can do with it. “My friends swear by it so I thought I should attempt it,” she tells People. “Nick and I don’t cook at all, but we both love eating!” Babe, it’s a blender. You can’t cook with it. Please obtain more items for your kitchen for sustenance, I beg of you. This wedding is reportedly happening sometime soon after Thanksgiving. I wish them the best, as much as I can.